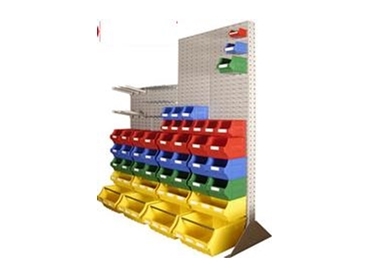 Dexion’s range of shelf, hanging and stackable Maxi bins allow you to solve any small parts storage challenge. They improve handling and retrieval, stock identification and can be incorporated into other Dexion storage systems. Maxi is a system of louvred panels, storage bins and accessories, for handling and storing a wide variety of small parts and components. The wide range of bin sizes allows components to be stored in convenient quantities and to be instantly visible and available for selection. Maxi hanging and stackable storage bins are the market leader in open fronted containers. Maxi Bins are available in six sizes and in five colours. Maxi storage bins are commonly hung on louvred panels, but their interlocking design enables Maxi Bins to be stacked securely without the bin splaying under load. Louvred panels form the backbone of the Maxi storage system. Louvred panels are pressed steel panels designed to allow all sizes of Maxi Bins to hang in a high density, free configuration, perfect for small parts picking. The special lip on the rear of the bin is seated over the louvre of the panel. The bin sits securely on the panel, but is easily removed when required. They are available in single, double, trolley and bench configurations. Louvred panels are often used in conjunction with Maxi Bins but there are many alternative accessories that can be used to accommodate more awkward shaped items and small part storage. Accessories include hooks and shelf trays.